This beautifully designed and made combination board and card game is simple to learn, but hard to win. Based on a game played by early settlers of Quebec, Carl Kresge's beautifully designed and made wooden game is a unique combination of board game and card game. The rules are simple, but it swiftly develops into a challenging competition. 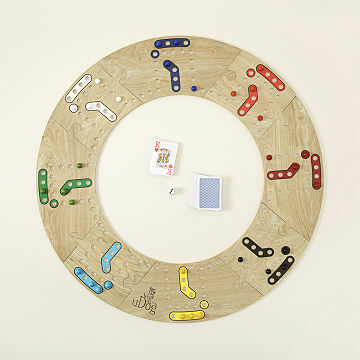 Players form teams, and move their tokens clockwise around the board according to the cards' values. The team that gets all eight tokens home, wins. Sound simple? It's not. Time, luck, and plenty of strategy are needed to win. Fortunately, this encourages great conversation, and sometimes, excited "table talk." May the best team win! Can be played with four, six, or eight players. Made in Grand Rapids, Michigan. Carl Kresge has always loved games. While traveling in Europe, he was introduced to one that immediately became his favorite. Back home in Grand Rapids, Michigan, a friend developed a new version so that more people could play it together. Carl was so enthused that, although he’d never done any screen printing or computerized wood cutting, he learned these skills and more to be able to make the game from scratch. He made a few for family members and friends, and before long, was flooded with requests. Eventually, he was unable to keep up with demand, and turned over most of the process to a local printer. He misses being more hands-on (and does pack every game himself for shipping), but such is the price of success. UDog is perfect for 'game night'. Think Sorry on steroids. To really enjoy the game one needs to be able to think several moves ahead and strategize best moves. Opposing teams will try to set you back. Best with good friends, good wine. Just wanted to updated our review, but had to submit a new one in order to stay that the vendor researched, contacted and sent out new board pieces so our board works great now. my family loved this because it was a combination of boards they grew up with and use cards. The game is the luck of the draw and strategy!. Wonderfully made! Lots of fun. Can't wait to play again! Everyone had an incredible time. Great way to get together. Have to work on working as partners. Learning curve there. I LOVE this product, it is perfect for a family/friends night in. My family has played it MANY times and we only got uDog a few days ago. This is why I was so disappointed when my family gathered around the table to play and majority of the cute puzzle pieces didn't fit. I really wish this weren't the case because I was very happy with the rest of the quality. The board is well made and should withstand years of playing! We can't wait to play this game! We love to play games, especially games that are unusual. I gave this as a gift to my husband who used to play board games with his grandmother all the time as a kid. We haven't had a chance to play the game yet (we plan to this weekend), but he is very excited to give it a try. He said after reading over the rules of game play that it seemed like a a lot of fun and he liked the different version of the board that you can put together. It is very solid construction too! I'm part of a group who play cards and games together once a month and love trying new games. We played this ---as advertised the rules are simple but winning hard, but familiarity with Parchisi, which we all played as kids helps--- and judged it well worth playing again.